The time you spend in the wild can be so liberating you will get a chance to experience nature in every possible way, and you will also explore yourself and all your potential. As a result, we decided to test some of the products on the market to see if any of them will provide the reliability and safety you need in the outdoors. In the Spyderco Tenacious Folding Knife Review, we tried to analyze the product features to see if it is what you need on an outdoors trip. This knife is reliable, versatile and durable. If you are looking for a heavy duty weapon that can do a lot of jobs, then this is specifically what you have been looking for. When you are using a knife in the wild, you want to make sure that you are using the most durable and reliable materials that won’t break or bend. This is what you get when you busy this knife because the blade is made using the highest quality of materials. This means that is sturdy enough to cut through different materials and will not break or bend under any circumstances. The 8Cr13MoV stainless and the non-reflective black coating will make the blade more durable for continuous cutting. How many times did you buy products that claimed stuff they can’t deliver? But this is not the case with this knife. The spyderco tenacious has been adequately tested by the manufacturers to ensure its durability and reliability. It is a high-quality knife that will provide consistent results every time you decide to use it. There is no need to keep your weapon in the open. This tactical knife can be easily folded and concealed to fit in any pocket or to be held however you want to. The folding feature will shorten its length and will make it so much easier to use and carry. A G-10 laminate handle is the best to have in a reliable knife because it is perfectly designed to minimize fatigue during cutting and this means that you will cut quickly and properly using minimum effort. Reliable and sturdy steel liners are included in the handle to increase its durability and reliability without increasing the thickness or the weight. This means that the knife is super sturdy and is still light and versatile to use in different situations. The position of the blade and the hole will allow you to open the knife and use it right away. It is the best tool to have on an outdoors experience where you need something reliable and durable. 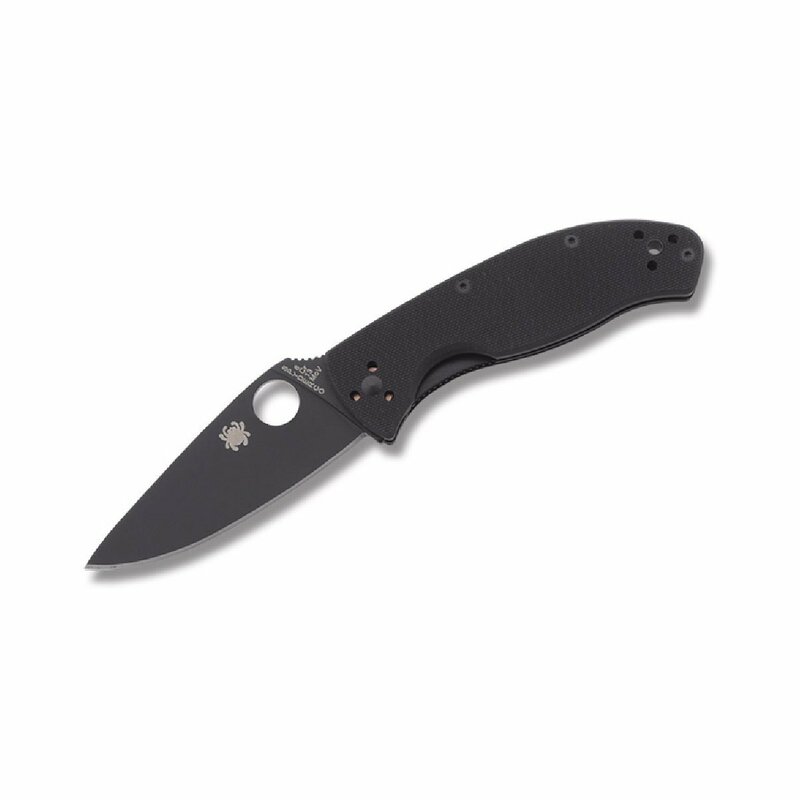 This Spyderco Tenacious knife has the strongest cutting ability for the blade length. It can also be carried in different positions for your convenience. A folding design that is easy to carry and use. Easy to open for fast and reliable performance. A sharp cutting edge that will cut through different materials. Made from the most durable materials. Can be carried in various ways. Some people found that the edge might not be too sharp to cut through tough materials. With frequent use, you might want to re-sharpen it often. The screws are not of the best quality, and you might want to adjust them a little if you want your knife to last for long. Q: Where is this knife made? Q: Does the black coating come off with repeated use? A: No, not really. The black coating seems to be of very high quality. Q: What is the size of the thumb hole on the knife? A: It is medium size. Q: Does this knife come with a holder? A: No, but it can fit beautifully in your pocket. Q: What is the length of the blade? A: It is probably 2 inches. To prepare this Spyderco Tenacious Folding Knife Review, we tried to put it to use, and we realized that it is one of the best knives on the market. It is high quality and durable and will cut through various materials. It is great value for your money, and the folding feature will make it super easy to carry.